Note: This Synoptic Discussion describes recent weather events and climate anomalies in relation to the phenomena that cause the weather. These phenomena include the jet stream, fronts and low pressure systems that bring precipitation, high pressure systems that bring dry weather, and the mechanisms which control these features — such as El Niño, La Niña, and other oceanic and atmospheric drivers (PNA, NAO, AO, and others). The report may contain more technical language than other components of the State of the Climate series. The Earth's ocean-atmosphere system continued in a weakening La Niña state during February 2018. Like the last couple months, the upper-level circulation pattern experienced several shifts over the contiguous United States (CONUS) during February, changing from a ridge/trough pattern to a trough/ridge pattern. This caused extremes in temperatures, with much warmer-than-normal temperatures during some weeks and colder-than-normal temperatures other weeks, with the month ending on a warm note nationally. This variability resulted in a monthly temperature anomaly pattern with warm anomalies dominating in the East and Southwest, and cold anomalies dominating in the central to northern Plains and other parts of the West. The variable circulation pattern resulted in above-normal precipitation across the northern Rockies to Great Lakes and part of the Southwest, with stalled and slow-moving frontal systems bringing much-above-normal precipitation from eastern Texas to the southern portions of the Northeast. But the circulation pattern kept most of the West and central to southern High Plains, and coastal Southeast, drier than normal. The active fronts and low pressure systems generated above-average severe weather during this normally low-severe-weather winter month. Wildfires were a problem, especially in the severely dry parts of the southern Plains and Southwest. Although widespread flooding resulted in the Mississippi to Ohio Valleys from the heavy rains, much of the precipitation fell over drought areas, especially in parts of the Plains, Alaska, and Hawaii, and much of the Mississippi Valley and Southeast to Northeast, so the national drought footprint shrank when compared to the beginning of February. The upper-level circulation, temperature, and precipitation anomaly patterns suggested that the atmospheric drivers originating in the equatorial Pacific (i.e., La Niña and MJO), North Pacific (PNA), North Atlantic (NAO), and Arctic (AO) had a controlling influence on the month's weather. See below for details. Animation of daily upper-level circulation for the month. Animation of daily surface fronts and pressure systems for the month. In the Northern Hemisphere, February marks the end of climatological winter which is the time of year when net solar heating is at its minimum due to the low sun angle, and an expanded circumpolar vortex results in the furthest southern extent of the jet stream. Polar air masses normally dominate the weather over the contiguous U.S. (CONUS), and the warm, dry subtropical high pressure belts have their least influence. 500-mb mean circulation for the CONUS for February 1-8, 2018, showing a long-wave ridge in the West and trough in the East. 500-mb mean circulation for the CONUS for February 9-14, 2018, showing a transitional pattern to a long-wave trough in the West and ridge in the East. 500-mb mean circulation for the CONUS for February 15-28, 2018, showing a long-wave trough in the West and ridge in the East. The upper-level circulation was very active this month and experienced two general (or "long-wave") regimes. During roughly the first week of the month, an upper-level ridge dominated the western CONUS with a trough over the East. The relative positions of the ridge axis and trough axis shifted day by day as short-wave troughs or lows moved through the upper-level flow. During the last two weeks, an upper-level trough dominated the West with a ridge over the East. The week in between these two regimes consisted of a transition period with upper-level systems distorting the long-wave pattern. Short-wave troughs and ridges migrated through the upper-level flow throughout the month, dragging surface fronts and low pressure systems with them. Each of these patterns was characterized by specific weather phenomena, temperature anomalies, precipitation anomalies, and impacts. 500-mb circulation anomalies for the CONUS for February 1-8, 2018. Temperature anomalies (departure from normal) for the CONUS for February 1-8, 2018. Precipitation anomalies (percent of normal) for the CONUS for February 1-8, 2018. The western ridge during roughly February 1-8 deflected storm systems away from the West and kept skies clear for the most part. Very little to no precipitation fell across most of the West and temperatures were warmer than normal. Pacific weather systems rode over the top of the ridge, bringing above-normal precipitation to the northern Rockies and northern Plains. Canadian air masses were funneled through the Plains and into the Southeast beneath the eastern trough, bringing colder-than-normal weather to most of the CONUS east of the Rockies. The air masses were generally dry and the northwesterly flow blocked Gulf of Mexico moisture, so the southern Plains were mostly drier than normal. But low pressure systems developed along the fronts as they lay across the Southeast, tapping Gulf of Mexico moisture and bringing above-normal precipitation to much of the area from the Lower Mississippi Valley to the Appalachians and Northeast. With below-freezing Canadian air, precipitation falling along the fronts and low pressure systems laid down a blanket of snow across the central to northern Plains, extending to the Northeast, while much of the West had a sorely deficient mountain snowpack. 500-mb circulation anomalies* for the CONUS for February 9-14, 2018. Temperature anomalies (departure from normal) for the CONUS for February 8-14, 2018. Precipitation anomalies (percent of normal) for the CONUS for February 8-14, 2018. The upper-level circulation pattern shifted during roughly February 9-14, with the trough migrating westward and weather systems beginning to favor the Southwest. Canadian fronts still plunged southward across the Plains and into the Southeast to East Coast, but Pacific fronts and weather systems moved across the West as well. The Canadian air masses kept temperatures below normal across the Plains to Great Lakes during this period; temperatures moderated across the West but still averaged warmer than normal; and a more southerly flow aloft favored warmer-than-normal temperatures in the Southeast. The Four Corners States benefited from Pacific moisture, but the lows that moved across the West mostly came in from a more northerly direction, which meant they were a bit drier than otherwise, so most of the West was still drier than normal. Upslope precipitation occurred as the Canadian fronts ran into the east slopes of the Rockies, and this was enhanced by passing upper-level weather systems, so the northern High Plains of Montana to South Dakota and Nebraska experienced above-normal precipitation. But the rest of the Plains and parts of the Midwest were cut off from the Gulf moisture source, so they were drier than normal. As before, when the fronts reached the Southeast, they slowed down and drew in Gulf of Mexico moisture, resulting in above-normal precipitation from the Lower Mississippi Valley to Northeast. Also as before, the below-freezing Canadian air allowed precipitation to fall as snow, keeping a snowpack across the central to northern Plains and extending into the Northeast. And some of the Pacific systems were cold enough to drop badly-needed snow across parts of the West. 500-mb circulation anomalies for the CONUS for February 15-28, 2018. Temperature anomalies (departure from normal) for the CONUS for February 15-28, 2018. Precipitation anomalies (percent of normal) for the CONUS for February 15-28, 2018. The upper-level trough struggled to maintain its grip across the West during the last two weeks of the month, with short-wave troughs and lows enhancing the long-wave trough as they migrated through the upper-level flow. The frequent passage of Pacific weather systems, along with their cloudiness and cooler air, left the West with below-normal temperatures. While they brought precipitation with them and increased the western mountain snowpack, only some parts of the West were wetter than normal — California especially missed out on the precipitation, racking up the third driest February in the 1895-2018 record. The fronts tended to stall out along the Mississippi and Ohio Valleys as they ran up against the ridge in the East. With a southerly flow feeding abundant Gulf of Mexico moisture into the region, low pressure systems moving along the stalled fronts generated widespread flooding rains and even outbreaks of severe weather. Above-normal precipitation occurred along this storm track from eastern Texas and eastern Oklahoma, to the Midwest and southern portions of the Northeast. The coastal Southeast, as well as the central to southern High Plains, were outside the storm track and ended up drier than normal. In addition to Gulf of Mexico moisture, much warmer tropical air was channeled northward across the eastern CONUS beneath the upper-level ridge, resulting in record to near-record warm temperatures. Below-freezing Canadian air masses kept the snowpack in place across the northern Plains, where temperatures were below normal, but the warmer air to the south and east greatly contracted the snowpack elsewhere east of the Rockies. 500-mb mean circulation for the CONUS for February 2018. 500-mb circulation anomalies for the CONUS for February 2018. Temperature anomalies (departure from normal) for the CONUS for February 2018. Precipitation anomalies (percent of normal) for the CONUS for February 2018. When conditions are averaged across the entire month, a western trough/eastern ridge pattern was evident in the upper-level circulation with somewhat of a positive tilt into the northern Plains. The circulation anomalies reflected the trough/ridge pattern, with below-normal height anomalies over the northern Plains to Pacific Northwest and above-normal height anomalies across the East Coast to Gulf Coast. The anomaly pattern also had a positive tilt, with the negative anomalies extending into Canada and centered over the northern part of Hudson Bay. The monthly temperature anomaly pattern reflected the monthly circulation anomaly pattern, with above-normal temperatures in the East beneath the positive height anomalies and below-normal temperatures across the northern and central Plains to western Great Lakes associated with the below-normal height anomalies. The monthly temperature anomalies across the West represented an average of the warm temperatures associated with the ridge at the beginning of the month and the cool temperatures associated with the trough during the last half of the month. The precipitation anomaly pattern for the month represented an additive result of the anomaly patterns for the various weeks, with the areas that were much wetter than normal during one or more weeks showing up wet at the monthly time scale, and those areas (especially the Far West and the central to southern High Plains) that were persistently dry every week showing up as quite dry at the monthly scale. The circulation during this month was also reflected in snow, drought, and regional records. Monthly temperatures were unusually warm across the East, where eight states had the warmest February in the 1895-2018 record and an additional 15 were in the top ten warmest category. The record warm states included Alabama, Florida, Georgia, South Carolina, North Carolina, Connecticut, Rhode Island, and Massachusetts. With cold Canadian air masses consistently traveling across the northern Plains on their way south, Montana had a top ten cold February, ranking sixth coldest on record, but was the only state to fall in the top ten coldest category. When daily temperature records are examined, the extreme warmth was more extreme, widespread, and/or persistent than the extreme cold. When integrated across the month, there were 7,306 record warm daily high (3,389) and low (3,917) temperature records. This was about 2.24 times the 3,256 record cold daily high (1,645) and low (1,611) temperature records. As noted earlier, February is at the end of the Northern Hemisphere climatological winter, the coldest season when heating demand peaks in the United States. Temperatures averaged across the month and across the CONUS gave February 2018 a rank of 41st warmest. But most of the warmth occurred in the more heavily populated South to Northeast, where temperatures were much warmer than normal to record warm. This gave the REDTI (Residential Energy Demand Temperature Index) for February 2018 a value which was 14th lowest (warmest) in the 124-year historical record for February. The flooding rains along stalled fronts near the end of the month were enough to put the monthly precipitation total over the top for several states along the Mississippi and Ohio Rivers and in the Northeast. Six states had a record wet February, including Arkansas, Missouri, Tennessee, Illinois, Indiana, and Pennsylvania. Widespread dryness occurred in the West, with California having the third driest February in the 124-year record. The southern High Plains were also extremely dry, especially parts of the Oklahoma and Texas panhandles and adjacent southwest Kansas and northeast New Mexico. The dryness in this area gave Kansas the 37th driest February, but heavy precipitation in other parts of the neighboring states mean the statewide totals for Oklahoma and Texas were wet and for New Mexico was near average. About four percent of the country was very dry (had February precipitation in the driest tenth of the historical record), but over a fourth (27.7 percent) was very wet (had February precipitation in the wettest tenth of the historical record). When averaged across the CONUS, February 2018 ranked as the sixth wettest February in the 1895-2018 record. Although the widespread flooding created hardship across several states, the heavy rains fell on many drought areas, resulting in contraction of drought and abnormal dryness across the Lower to Mid-Mississippi Valley and eastern parts of the southern Plains. Drought also contracted across much of the Southeast, parts of the central to northern High Plains, in the Northeast, and parts of Alaska and Hawaii. But drought and abnormal dryness expanded and intensified in the areas where it didn't rain, specifically parts of the West, Plains, and coastal Southeast. Contraction outweighed expansion, so at the national level drought shrank from 38.4 percent of the CONUS at the end of January to 31.3 percent of the CONUS at the end of February (from 32.1 percent to 26.2 percent for all of the U.S.). The month began with several large wildfires burning in the southern Plains where prolonged dry conditions provided ideal burning conditions; a few more large wildfires were burning in the northern Plains and along the Gulf of Mexico Coast. As the month progressed, large wildfires broke out in the Southwest. Rains later in the month reduced the number of fires, but several large wildfires continued to burn at the end of the month in the West and southern Plains (wildfire maps for February 2, 9, 21, 23, 28). February began with 28.6 percent of the CONUS experiencing a snow cover. The snowstorm track kept to the north during the first half of the month, with winter storms laying down a snow cover from the central and northern Plains, across the Midwest, to the Northeast. The snow cover area increased to about 45 percent as major storms passed, then decreased to around 35 percent in their aftermath. The western trough during the last half of the month increased snow cover in the West, with the area peaking at about 48.0 percent of the CONUS on February 23rd, but the warm temperatures associated with the ridge over the eastern CONUS melted most of the snow cover from the central Plains to Northeast. The month ended with about 35.0 percent of the CONUS covered in snow. Based on the NOAA-Rutgers University satellite record, when snow cover is averaged across the month, February 2018 had above-average snow cover in the central to northern Plains and parts of the Northwest, beneath the frequent upper-level troughs; snow cover was below average in the Southwest and Ohio Valley to Northeast, where temperatures averaged warmer than normal for the month. The atmospheric circulation needed to create the instability and dynamics favorable for severe weather consists largely of a southwesterly flow across the central part of the CONUS. This upper-level circulation pattern occurred during the last half of the month. According to preliminary reports, 46 tornadoes occurred in February 2018, which is more than the February average of 29. About a dozen and a half of them occurred on the 6th, 7th, and 10th when low pressure systems moved along cold fronts that lay across the Gulf Coast States. But more than half of the tornadoes occurred on the 24th in the Ohio Valley under favorable dynamical conditions: a stalled front and low pressure systems moving along the front provided the surface convergence (or lift) and vertical instability; a southerly flow at the surface brought Gulf of Mexico moisture which provided a form of latent heat energy; the circulation at the upper levels of the atmosphere was out of the southwest, which provided a vertical twisting of the wind direction with height; and divergence in the upper atmosphere enabled upward-moving air to spread out horizontally in the upper levels, which intensified the vertical motion and violence of the severe storms. Typically tropical cyclone activity is enhanced in the Eastern North Pacific and inhibited in the North Atlantic during El Niños, and inhibited in the Eastern North Pacific and enhanced in the North Atlantic during La Niñas, due mostly to changes in vertical wind shear during the two extreme events. The relationship is unclear during ENSO-neutral events. The tropical Pacific Ocean continued in a La Niña state during February 2018, but the La Niña was weakening. The Atlantic hurricane season runs from June 1st through November 30th and the Eastern North Pacific hurricane season runs from May 15th through November 30th. No tropical storms or hurricanes developed in these basins during February 2018. No tropical cyclones formed in, or moved into, the central North Pacific. A tropical storm, a tropical cyclone, and a tropical disturbance developed in the western North Pacific and South Pacific in or near the U.S.-Affiliated Pacific Islands (USAPI). Tropical Storm Sanba developed in western Micronesia in early February. Sanba passed near Koror in the Republic of Palau and crossed the Philippines before dissipating at mid-month. Another tropical disturbance (95W) developed in western Yap State (in the Federated States of Micronesia) and southern Palau during the last half of the month, but quickly dissipated. In the South Pacific, Tropical Cyclone Gita developed in early February and brushed American Samoa before intensifying to severe tropical cyclone status. Gita moved south away from the Samoan Islands, its remnants eventually being swept up in the Southern Hemisphere's mid-latitude circulation at mid-month. North America monthly upper-level circulation pattern and anomalies. The upper-level circulation pattern during February, when averaged for the month, consisted of a trough over the western CONUS and ridge over the eastern CONUS. The strongest positive height anomalies occurred over the Gulf Coast to East Coast. The below-normal height anomalies in the northwest CONUS extended across central Canada to southern Greenland. Map of monthly precipitation anomalies. February was drier than normal across much of the West, from the southern High Plains to central Plains, along the coastal Southeast, in parts of the northern Plains, and in southeast Alaska. The month was wetter than normal across the northern Rockies and most of the northern Plains, parts of the central to southern Rockies, and most of the country from eastern Texas and eastern Oklahoma, across the Mississippi and Ohio River Valleys, to the Northeast. Hawaii and most of Alaska were wetter than normal. San Juan, Puerto Rico, was wetter than normal. Map of monthly temperature anomalies. Monthly temperatures were warmer than normal from the Lower Mississippi Valley, Ohio Valley, and eastern Great Lakes, to the East Coast, in parts of the Southwest, and western to northern Alaska. February was colder than normal across the western Great Lakes, northern to central Plains, parts of the West, and across southeastern Alaska. Northern Hemisphere monthly upper-level circulation pattern and anomalies. Global Linkages: The upper-level (500-mb) circulation anomaly pattern over North America was part of a complex long-wave pattern that stretched across the Northern Hemisphere. There were three centers of negative height anomalies and three centers of positive height anomalies. These anomaly centers were coupled together both longitudinally (east/west) and latitudinally. North America had a ridge/trough/ridge pattern, while Eurasia had a trough/ridge/trough pattern. The anomaly patterns were also paired across the Arctic Ocean — eastern CONUS-Canada-Arctic Ocean-eastern Asia, and eastern North Pacific-Arctic Ocean-central Asia. Especially notable was the shift of the circumpolar vortex southward over North America and Europe (below-normal height anomalies) with the above-normal height anomalies over much of the Arctic Ocean. The above-normal 500-mb heights were associated with upper-level ridging, or with weakened troughs, at the mid-latitudes; below-normal precipitation (over central Asia and northern Scandinavia); below-normal snow cover (over the eastern CONUS and southern Asia); above-normal surface temperatures (over the eastern CONUS, southern Asia, and northeastern Siberia to western Alaska); and warm SST anomalies (in the Bering Sea, western North Atlantic, and parts of the North Pacific, South Pacific, and Indian Oceans). The areas of below-normal 500-mb heights were associated with upper-level troughing, or with weakened ridges; near- to below-normal surface temperatures (over Canada to the north central CONUS, Western Europe to northwestern Africa, and northeastern China); cool SST anomalies (in parts of the northern and eastern North Atlantic); above-normal precipitation (over the north central CONUS to adjacent southwestern Canada, and southeastern Europe); and above-normal snow cover (over the north central CONUS and eastern Europe). Parts of central North America, northwestern Africa, western Australia, and much of Asia were near to cooler than normal, and parts of the equatorial Pacific, eastern South Pacific, South Atlantic, and Indian Ocean had cooler-than-normal SST anomalies. But with parts of eastern and northwestern North America, southern and northeastern Asia, the eastern half of Australia, and much of South America and Africa having warmer- to much-warmer-than-normal temperatures, and large portions of the Atlantic, Pacific, and Indian Oceans having warmer-than-normal sea surface temperatures, the February 2018 global temperature was still above normal. Description: Oceanic and atmospheric conditions in the tropical Pacific Ocean can influence weather across the globe. ENSO is characterized by two extreme modes: El Niño (warmer-than-normal sea surface temperature [SST] anomalies in the tropical Pacific) and La Niña (cooler-than-normal SST anomalies), with the absence of either of these modes termed "ENSO-neutral" conditions. Status: La Niña conditions were present during February 2018 with below-average SSTs across the east-central equatorial Pacific Ocean, but the La Niña was weakening. Teleconnections (influence on weather): To the extent teleconnections are known, the typical temperature and precipitation patterns associated with La Niña during February include above-normal temperatures across the southern Plains to Southeast and Mid-Atlantic region; below-normal temperatures across the West and the central to northern Plains to Upper Midwest; near-normal temperatures in between; above-normal precipitation in the Pacific Northwest to northern Rockies and northern California, along the Mississippi River Valley, and in the Tennessee Valley to Northeast; and below-normal precipitation across most of the Southwest, southern Plains, and coastal Southeast to Mid-Atlantic region. Comparison to Observed: The February 2018 temperature and precipitation anomaly patterns are in very good agreement with the teleconnections for La Niña. Description: The MJO is a tropical disturbance or "wave" that propagates eastward around the global tropics with a cycle on the order of 30-60 days. It is characterized by regions of enhanced and suppressed tropical rainfall. One of its indices is a phase diagram which illustrates the phase (1-8) and amplitude of the MJO on a daily basis. The MJO is categorized into eight "phases" depending on the pattern of the location and intensity of the regions of enhanced and suppressed tropical rainfall. The MJO can enter periods of little or no activity, when it becomes neutral or incoherent and has little influence on the weather. Overall, the MJO tends to be most active during ENSO-neutral years, and is often absent during moderate-to-strong El Niño and La Niña episodes. Status: The MJO Wheeler-Hendon index began the month strongly in phase 7, transitioned weakly through phases 8 and 1, ending the month in phase 2. During part of the month, the MJO destructively interfered with the La Niña, which reduced its influence, while it constructively interfered with it at other times. Other aspects of the tropical ocean-atmosphere system (referred to in the CPC reports as the background or low frequency [i.e., La Niña] state, Kelvin and Rossby waves, and tropical cyclone activity) also appeared to play a role in influencing the month's climate (especially Rossby waves and the base state, as well as Kelvin waves) as well as mid-latitude influences (MJO updates for February 5, 12, 19, and 26). Teleconnections (influence on weather): The MJO's temperature and precipitation teleconnections to U.S. weather depend on time of year and MJO phase. To the extent teleconnections are known, the February (January-March) teleconnections for temperature are shown here and for precipitation are shown here. Comparison to Observed: The MJO is transitory and can change phases (modes) within a month, so it is usually more closely related to weekly weather patterns than monthly. In the case of February 2018, the MJO transitioned through four different phases throughout the month, with some of the phases having opposite teleconnections to preceding phases. Consequently, the monthly temperature anomaly pattern does not match the temperature anomaly patterns associated with the MJO phases experienced this month. The MJO stayed in phase 7 for the first half of the month, and the weekly temperature anomaly pattern for February 11-17 is a reasonable match for the phase 7 teleconnections, but the preceding two weeks are not. The MJO rapidly transitioned through phases 8 and 1 during February 18-24 and the temperature anomaly pattern for that week does not match the teleconnection patterns for either of those phases. The MJO was in phase 2 during February 25-March 3, and the temperature anomaly pattern for that week matches the teleconnections in the West but not in the East, although the teleconnections in the eastern CONUS are very weak. Neither does the monthly precipitation anomaly pattern match the precipitation anomaly patterns associated with the MJO phases experienced this month. But the weekly precipitation anomaly patterns show some agreement with the phase 7 teleconnections during February 4-10 and February 11-17 and with the phase 2 teleconnections during February 25-March 3. Description: The PNA teleconnection pattern is associated with strong fluctuations in the strength and location of the East Asian jet stream. PNA-related blocking of the jet stream flow in the Pacific can affect weather downstream over North America, especially the West and especially in the winter half of the year. Status: The daily PNA index was positive for the first week then negative for the rest of the month, averaging negative for the month as a whole. The 3-month-averaged index was negative. Teleconnections (influence on weather): To the extent teleconnections are known, a negative PNA for this time of year (January on the quarterly teleconnection maps) is associated with above-normal temperatures across the southern Plains to East Coast; below-normal temperatures across the West Coast and northern Plains to Alaska; above-normal upper-level circulation anomalies over southeastern North America; below-normal upper-level circulation anomalies over western North America; and above-normal precipitation in the Northwest, Great Basin, and most of the CONUS along and east of the Mississippi River. Comparison to Observed: The February 2018 monthly upper-level circulation anomaly pattern over North America is a very good to the teleconnections for a negative PNA, the monthly temperature anomaly pattern is a good match, and the monthly precipitation anomaly pattern is a very good match east of the Rockies. Description: The AO teleconnection pattern relates upper-level circulation over the Arctic to circulation features over the Northern Hemisphere mid-latitudes and is most active during the cold season. Status: The daily AO index was positive for the first half of the month, then turned neutral and ended the month sharply negative, averaging slightly positive for the month. The 3-month-averaged index was near zero. Teleconnections (influence on weather): To the extent teleconnections are known, a positive AO in February (January-March in the AO Composites table) is typically associated with below-normal upper-level circulation anomalies over the Arctic Ocean and Greenland into northern Canada; above-normal upper-level circulation anomalies over the eastern half of the CONUS, across the North Atlantic, and across much of the North Pacific; above-normal temperatures across most of the CONUS east of the Rockies; near-normal temperatures over the West and southern Plains; and drier-than-normal conditions in the Gulf Coast and Atlantic Coast areas, across much of California, and Kansas to Oklahoma; and wetter-than-normal conditions from Arkansas to the Ohio River and in western Washington State. Comparison to Observed: The February 2018 monthly upper-level circulation anomaly pattern matches over the eastern CONUS, much of the North Atlantic and North Pacific, and Canada, but not over the Arctic and is not as strong over the western CONUS. The monthly temperature anomaly pattern in the CONUS shows good agreement with the teleconnections over the South to Northeast, and generally over the West, but not in the Plains. 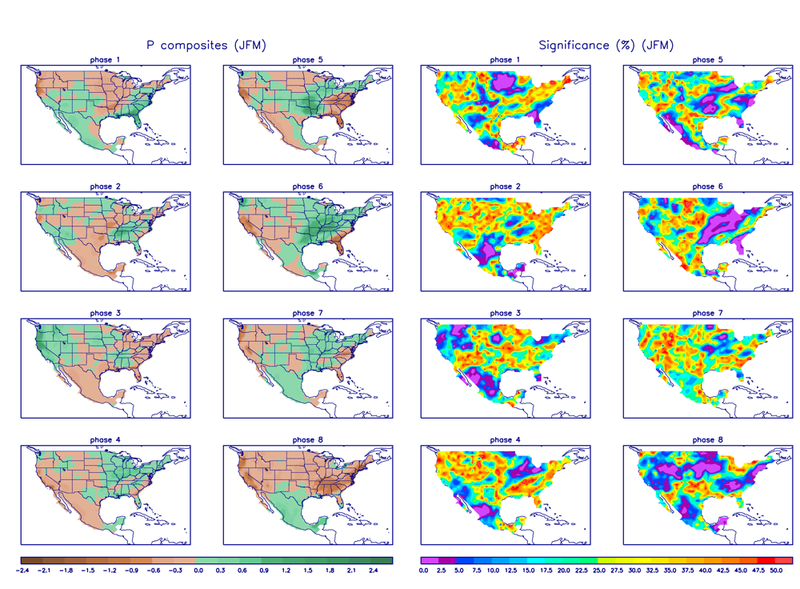 The monthly precipitation anomaly pattern over the CONUS matches where teleconnections exist, except in New England. Description: The NAO teleconnection pattern relates upper-level circulation over the North Atlantic Ocean to circulation features over the Northern Hemisphere mid-latitudes. Status: The daily NAO index was positive for most of the month, turning negative at the end of the month, and averaged positive for the month. The 3-month-averaged index was positive. Teleconnections (influence on weather): To the extent teleconnections are known, a positive NAO during this time of year (January on the quarterly teleconnection maps) is associated with above-normal upper-level circulation anomalies over the central to eastern CONUS, extending across the North Atlantic to Western Europe; below-normal circulation anomalies over northern Canada to Greenland; above-normal temperature anomalies from the Plains to East Coast; and drier-than-normal precipitation anomalies in California to Nevada, but the precipitation teleconnections are few and weak. Comparison to Observed: The February 2018 precipitation anomaly pattern agrees with the teleconnections over California and Nevada, but that may be a coincidence since the precipitation teleconnections are weak. The upper-level circulation anomaly pattern agrees over the eastern CONUS and most of the North Atlantic, but not over the rest of North America. The temperature anomaly pattern agrees except in the northern Plains. Description: The WP teleconnection pattern is a primary mode of low-frequency variability over the North Pacific and reflects zonal and meridional variations in the location and intensity of the (East Asian) jet stream in the western Pacific. Status: The monthly WP index was positive, as was the three-month average WP index. Teleconnections (influence on weather): To the extent teleconnections are known, a positive WP during this time of year (January on the quarterly teleconnection maps) is typically associated with above-normal temperatures from the Midwest to Northeast; below-normal temperatures in the Southwest; near-normal temperatures elsewhere; above-normal circulation anomalies over eastern North America; below-normal circulation anomalies over the western CONUS; and above-normal precipitation from Oklahoma to the Ohio Valley. Comparison to Observed: The February 2018 monthly temperature anomaly pattern shows little agreement with the teleconnections for a positive WP. The upper-level circulation anomaly pattern shows some agreement, but it seems shifted. The precipitation anomaly pattern is a very good match for the one region where teleconnections exist. Description: The TNH teleconnection pattern reflects large-scale changes in both the location and eastward extent of the Pacific jet stream, and also in the strength and position of the climatological mean Hudson Bay Low, and is dominant in the winter months. The pattern significantly modulates the flow of marine air into North America, as well as the southward transport of cold Canadian air into the north-central United States. Status: The TNH index was positive during February. Teleconnections (influence on weather): To the extent teleconnections are known, a positive TNH is typically associated with colder-than-normal temperatures for much of the country as well as eastern Canada, drier-than-normal conditions in the West, and slightly wetter-than-normal conditions in the Tennessee Valley. The upper-level circulation anomalies for a positive TNH are below-normal 500-mb geopotential heights over the eastern two-thirds of Canada and the north central U.S., and above-normal heights over the northeastern Pacific and Gulf of Mexico into the western North Atlantic. Observed: The February 2018 monthly upper-level circulation anomaly pattern agrees very well with the teleconnections for a positive TNH over the northeastern North Pacific, North America, and North Atlantic. The monthly temperature anomaly pattern agrees in general, although the cold anomaly area is bigger than what occurred and the Southeast is near normal in the teleconnections while it was warmer than normal during February 2018. The monthly precipitation anomaly pattern agrees over the Tennessee Valley and the West where there are the few teleconnections. Description: The EP-NP teleconnection pattern relates SST and upper-level circulation patterns (geopotential height anomalies) over the eastern and northern Pacific to temperature, precipitation, and circulation anomalies downstream over North America. Its influence during the winter is not as strong as during the other three seasons. Status: North Pacific SSTs warmed substantially during February in the north central North Pacific and in the eastern equatorial Pacific. These trends significantly reduced the cold SST anomaly pools, with much of the North Pacific now having warmer-than-normal SSTs. The average sea level pressure (SLP) field map and SLP anomaly field map indicated that the North Pacific's Aleutian Low was weaker than normal and/or shifted, and the North Atlantic's Icelandic Low was also weaker and/or shifted. They also indicated that the North Atlantic High and North Pacific High were stronger than normal. The February 2018 monthly EP-NP index was slightly positive, with the 3-month running mean slightly positive. Teleconnections (influence on weather): To the extent teleconnections are known, a positive EP-NP index this time of year (April on the quarterly teleconnection maps) is typically associated with cooler-than-normal temperatures across the CONUS from the Great Plains to East Coast (except the Southeast) and across central to eastern Canada; above-normal temperatures over Alaska; above-normal upper-level circulation anomalies (stronger upper-level ridge) over Alaska and western Canada; and below-normal upper-level circulation anomalies across central to eastern North America (stronger upper-level trough) and over the central North Pacific. The precipitation teleconnections are weak but suggest wetter-than-normal conditions over Wyoming and the Midwest. Comparison to Observed: The February 2018 monthly upper-level circulation and temperature anomaly patterns show little agreement with the teleconnections associated with a positive EP-NP, as they appear shifted and incomplete. The monthly precipitation anomaly pattern generally agrees where the few teleconnections exist. MJO agreement with the temperature and precipitation anomaly patterns, by week. Examination of the available circulation indices and their teleconnection patterns, and comparison to observed February 2018 weekly and monthly temperature, precipitation, and circulation anomaly patterns, suggest that the weather over the CONUS in February was influenced by a variety of equatorial and mid-latitude atmospheric drivers, possibly acting in concert. 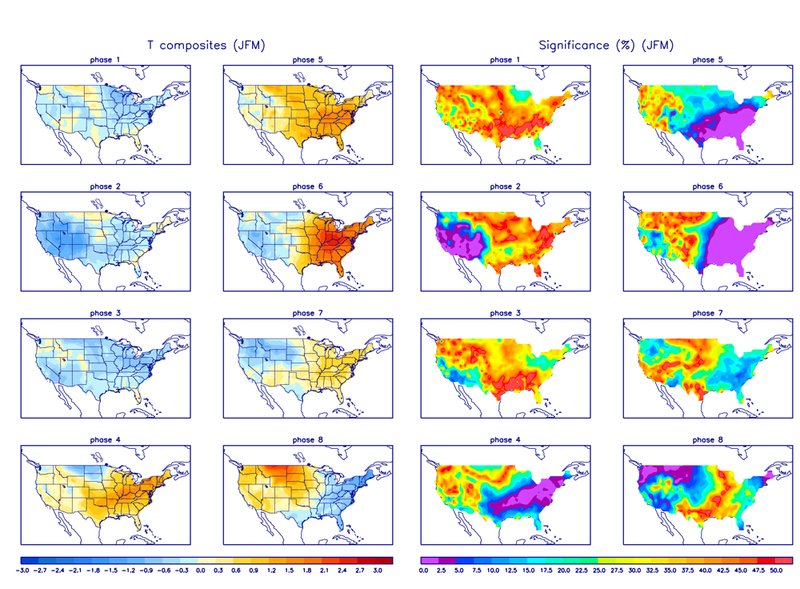 La Niña, PNA, AO, NAO, and TNH all had most teleconnections in agreement with the monthly circulation, temperature, and precipitation anomaly patterns in most parts of the CONUS and, in some cases, most of the North Pacific-North America-North Atlantic region. The MJO agreed during some weeks (see adjacent table). The WP matched for precipitation, but not temperature or circulation, which suggests the precipitation match may have been a coincidence. The EP-NP did not appear to be a player this month. For the precipitation teleconnections, La Niña, MJO, PNA, AO, TNH, WP, and even the EP-NP all had above-normal precipitation teleconnections for some or all of the Arkansas to Ohio Valley region. This month illustrates how the atmospheric circulation for the month can reflect several atmospheric drivers (or modes of atmospheric variability) in a way that the drivers in the equatorial Pacific, North Pacific, North Atlantic, and Arctic Ocean appear to have been harmoniously synchronized. This random congruence or positive reinforcement of drivers might explain why some extreme weather events (such as record precipitation and widespread flooding) occasionally occur. NOAA National Centers for Environmental Information, State of the Climate: Synoptic Discussion for February 2018, published online March 2018, retrieved on April 18, 2019 from https://www.ncdc.noaa.gov/sotc/synoptic/201802.